Welcome to Studio Ink Well. Our work covers a wide range of styles and we are open to all ideas that you can throw at us. We draw all designs in-house and can tailor it to your specification. At the end of the day, it is your body and we want you to not only enjoy your experience with us at the shop but the art you carry on your skin for many years to come. We specialize in making your body look beautiful with the artwork we provide striving to do this at the highest standards. We are always looking to push the boundaries of tattooing. There is a wide range of artwork on display in the studio. We can also produce artwork to order if you have something in mind. Dave is the shop owner and founder of Studio Ink Well. 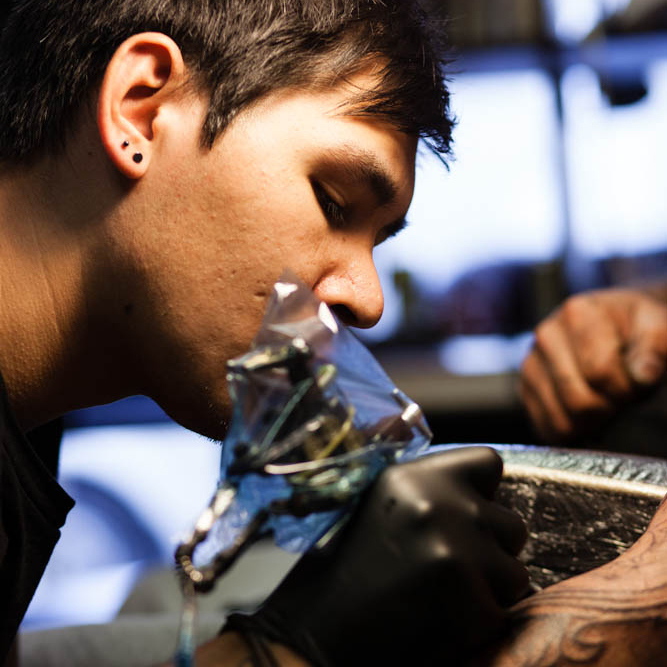 He has been tattooing since 2013 after completing his apprenticeship in Bradford and also has a BA Degree in Graphic Design from Liverpool John Moores University. After spending some time in the design industry, he decided that his skills were better suited to skin and hasn't looked back since. His artistic repertoire spans many different styles, but his main passions lie in Japanese, graphic work and script. He also likes POP vinyl figures. Have a tattoo in mind? Let's chat!